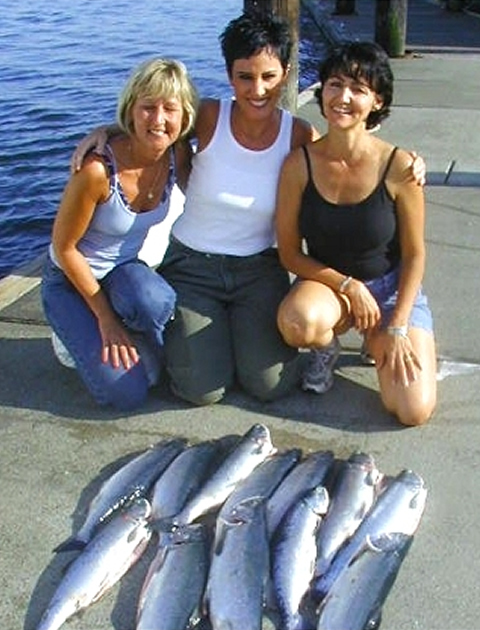 The Coho or “Silver Salmon” is a favorite of the Seattle Washington Silver Salmon fishing arena. With their wily unpredictability they can provide a treat to any angler looking for excitement at the end of a tight line. The Coho average between eight and twelve pounds and around twenty four to thirty inches in length. Adults are distinguished by their bright silver color, and the small black spots that appear on their backs. As is the case with many of the salmon species found in the Seattle Washington Silver Salmon fishing grounds the males develop a rather prominent hooked snout that are punctuated by a series of large sharp teeth. After feeding on rich baitfish like anchovies and sardines the silvers make their way back into the Straight of Juan de Fuca for their trek to their spawning grounds. 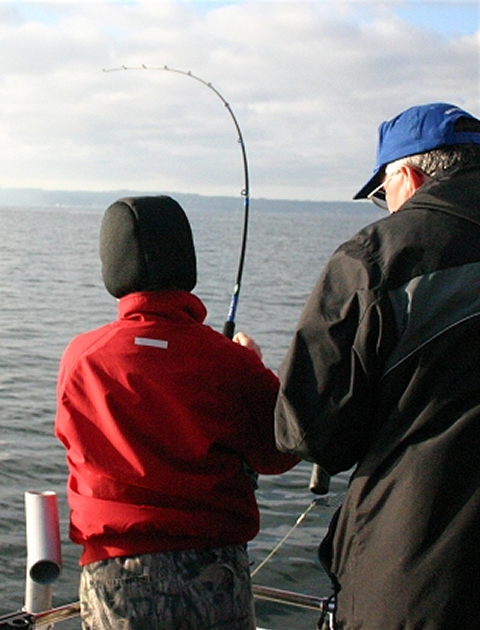 It is this seasonal migration that provides the opportunity for local anglers to take advantage of some of the best Seattle salmon fishing available. Because of their signature style of battling, Seattle Silver Salmon fishing is a favorite of many local seasoned anglers. Though they may lack the intense stamina of the larger Chinook salmon the Silver is still one of the most sought after of Seattle’s salmon fishing family because of their signature style of battling an angler when hooked. These fish put up a great fight and often leap clear of the water a number of times in the course of being brought to the boat. They are quick to make a strike on a number of different lures and bait. A number of different approaches prove successful with Silvers, and since the fish are so willing to strike it is no wonder that there are so many ways of enticing them. Probably the most popular method for this particular element of Seattle Washington Silver Salmon fishing is trolling with downriggers using light tackle to fight the fish. Favored lure colors of Green, white and blue typically provide the best results. Trolling with the classic plug cut herring is also a popular way to target these game fish. Of course there are a host of other methods. All Star Charters are proud to put the talent and experience of one of the nations most experienced Silver salmon fishing guides at your disposal to insure that your pursuit of Seattle Washington Silver Salmon and other members of the Seattle Washington salmon fishing family proves to be fun filled and action packed, and that your day on the water will be one that you remember for many a year to come.